It took more than 5,500 days and a helluva lot of help from Apple (AAPL), but the Nasdaq is finally celebrating a new all-time closing high. The index that's home to tech stars like Facebook (FB), Google (GOOGL) and Amazon (AMZN) climbed to 5,056 on Thursday. 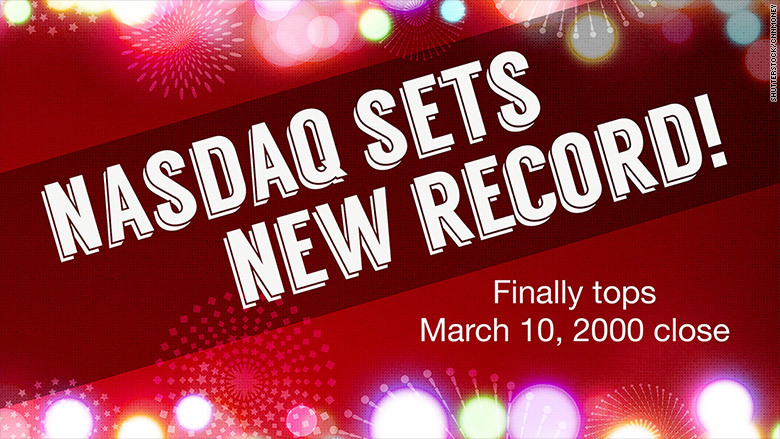 That's the highest level the Nasdaq has ever closed at, whipping out the previous record set on March 10, 2000 of 5,048.62. Today marks a major milestone in the investing world, in part because it means the Nasdaq has finally gotten over the Dot-com bubble that popped in early 2000. "It's an enormous deal psychologically," said Peter Kenny, chief market strategist at the Clearpool Group. It's also getting closer to its intraday record level of 5,132.52 that was also set on March 10, 2000. This is especially momentous because the Dow and S&P 500 hit record territory years ago, but it took the Nasdaq a long time to climb back from the bursting of the bubble. Another bubble in tech? 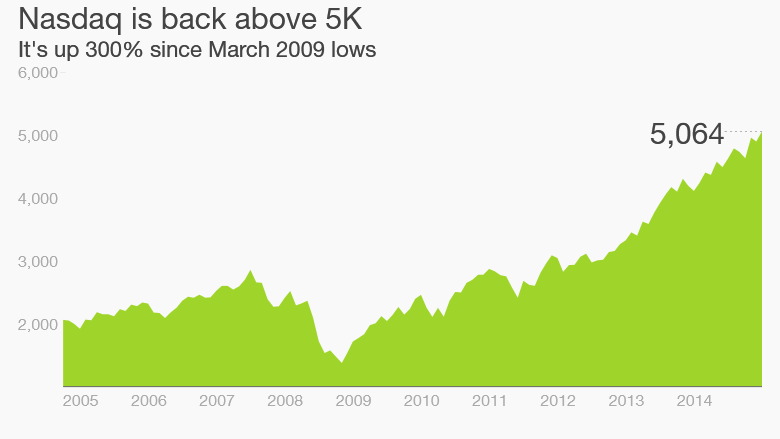 The Nasdaq record may also serve as a spooky reminder for many investors about what can go wrong in the market. Fifteen years ago people were going crazy over money-losing tech stocks like Pets.com (and bad Ricky Martin songs) that eventually imploded, hurting the retirement accounts of millions of Americans. Does the fact that the Nasdaq back at these levels signal another bubble in tech stocks? It's a reasonable question to ask but don't forget it took forever to return to these levels. During that time young tech startups grew into mature tech giants that are making billions of dollars and even doing adult things like paying dividends. Investors are no longer placing ridiculous valuations on unprofitable Nasdaq companies with unproven business models. Earnings multiples may be stretched, but they look nothing like the heady days of 2000. "Fifteen years ago people were buying companies that made nothing, had no earnings and only offered the hope that buyers would be able to get out at a higher price based on speculation," said Kenny. "Today the Nasdaq is much more structurally sound and is refreshingly rooted in a more sustainable earnings narrative," he said. All grown up: Russ Koesterich, chief investment strategist at BlackRock, agreed that things look much more stable today. "I don't think we're in a bubble," he said. Just like most people, the Nasdaq looks a lot different than its 2000 self. Believe it or not, only 43% of its weighting is derived from technology stocks, compared with 65% during its previous record, according to Nasdaq. Today, the index is more skewed towards consumer services, health care and even financials. That helps explain why the recent Nasdaq rally has been led by some decidedly non-techy names, including Kraft (KRFT), the food giant that Warren Buffett is merging with Heinz. Other big Nasdaq winners this year include Starbucks (SBUX), Dollar Tree (DLTR), Walgreen (WBA) and Tractor Supply (TSCO). But that doesn't mean the Nasdaq has forgotten its roots. The best performer in the Nasdaq 100 this year is Netflix (NFLX), the fast-growing moving and TV streaming service.